Talking about forecasting, today Anthony Watts reveals his time machine trip (archived here, latest update). He traveled to 2041, hung about for thirty years to 2070, and found that there weren't as many people affected by heat as scientists predicted back in 2015. Anthony doesn't give away where he stores his time machine. It must be quite a marvelous thing. Not only did it take him to 2041, but it took him all around the USA so that he could count the number of people living in different places. From the National Center for Atmospheric Research/University Corporation for Atmospheric Research and the Department of “ignored data in favor of modeled simulations” comes this claim from Trenberth’s mountain climate alarm lair. Kevin Trenberth is one of the very few climate scientists whose name WUWT deniers recognise. So Anthony added his name to his article, even though Dr Trenberth wasn't an author. He just happened to work at the same university. Anthony was afraid that his rabble might not realise they were meant to reject the science. Which shows how slow Anthony is. His deniers are very well trained. They automatically reject all reputable science no matter who did the research. What prompted Anthony to take his time machine for a burst was a new paper in Nature Climate Change. A team of scientists led by Bryan Jones did an interesting study. They looked at likely population changes across the USA and married that with likely climate changes over the country. The climate projections were based on eleven high resolution models from the North American Regional Climate Change Assessment Program. They included global and regional climate models, and the projections were for the period 2041 to 2070. In the models, the assumption was that there would be no major reductions in greenhouse gas emissions over the period studied. The model runs were based on the Special Report on Emissions Scenarios (SRES) A2 scenario (which is described in the supplementary info and in an IPCC publication). The researchers then analysed the climate projections against the results from a new demographic model, to see what populations would be in the different regions. The assumption in the case of demographic trends, was that they would be the same as current trends. This allowed them to estimate the proportion of people who would be living in areas likely to get high temperatures in the future. This graphic illustrates the expected increase in average annual person-days of exposure to extreme heat for each U.S. Census Division when comparing the period 1971–2000 to the period 2041–2070. Person-days are calculated by multiplying the number of days when the temperature is expected to hit at least 95 degrees (35◦C) by the number of people who are projected to live in the areas where extreme heat is occurring. The scale is in billions. Source: ©UCAR. There are quite big differences across the USA, as you'd expect. The graphic is headed with "extreme heat on the rise". However the researchers didn't look at what I'd call "extreme heat". Their cutoff was 35C. I can accept that this can be used as an indicator of extreme heat though. The authors listed some caveats to their analysis, including that they didn't distinguish between rural and urban, or urban heat island effect. Nor did they look at different demographic characteristics, like age, income level etc - though they have a bearing on a person's response to excessive heat. (Younger people are better able to survive excessive heat than older people. Wealthier people can afford better air conditioners etc). While it's mentioned early in the paper, the analysis doesn't indicate expected mortality from heat waves. I've read elsewhere that heat waves are particularly dangerous when there's little or no cooling off at night, and when they go on for an extended period. This analysis doesn't cover that. Still, it's interesting for what it is. There have been quite a number of papers on excessive heat and heat waves - in the past as well as projections for the future. I don't know if there's been one that looks across all the USA like this one did. In Australia there have been several studies looking at the excessive deaths during particular heat wave events in different cities - Sydney, Brisbane, Melbourne etc. There'll be more no doubt. Here, we focus on systematically quantifying the exposure component of vulnerability to extreme heat in the US as a function of both climate and population change. Our results represent a first step towards understanding how patterns of exposure emerge as a result of the interaction between changes in population structure and regional climate. It looks like another case of the press release going beyond the actual research, at least on a casual reading. It doesn't specifically make the claim that the paper is about heat waves, but that's what a reader would infer from the press release. Only one problem: actual data on U.S. Temperature Extremes does not support the claim. The only conclusion that can be drawn is that Anthony got into a time machine and drove to the year 2041 and remained till 2070. And collected data. Actual data doesn’t seem to support the claim of increasing high temperatures. Anthony's first chart was national averages over June to August (combined). Anthony, you'll be surprised to know, doesn't believe in detail. He prefers to gross things up. If you look at the chart above, you'll see that the projections indicate more people in the south and west will be affected by excessive heat days than people in the north eastern section of the USA. Averaging nationally won't tell you much about what is happening in different places even if the paper were about the past instead of 25+ years ahead. Anthony's second chart was the number of state heat records over the record. Naturally enough, there were more records broken when there were fewer records! Anthony's third chart was of a heat wave index. The research wasn't about heat waves. It was about excessive heat days and the number of people experiencing them. Another problem was that although the paper was about the proportion of people affected by heat in the future, Anthony didn't mention population. As an aside, the "heat wave index" used in US papers is an odd one. I traced it back to a paper by Kenneth Kunkel et al (1999). It's a fairly crude measure, being described as "the number of heat waves of 4-day duration with an average temperature exceeding the threshold for a 1 in 10 year recurrence". In that paper it wasn't described as an "index". That usage was picked up later. I struck a brick wall after getting to the paper. I think it's fair to assume that the "one in ten year recurrence" is fixed but the paper doesn't clarify that. That is, whether the "one in ten years" is a moving feast - or will be as the world warms, or if it's "one in ten years" as expected given the climate of the twentieth century - or the probability derived from when records began to 1998. The mean annual temperature over the contiguous USA as a whole didn't start going up noticeably until a few years ago. It's probably time the definition was clarified if not refined. There have been attempts to do so elsewhere, such as in this CSIRO/BoM technical bulletin by John Nairn and Robert Fawcett. Brian is more concerned about his wallet than about hot weather. Or maybe he's just letting everyone know that he has a strange tic (like Tourette's). Every time I see that something “could possibly” happen or “might” happen, I check for my wallet. The same claim could just as accurately be made using the words “could possibly not happen” or “might not” happen. george e. smith did some sums and worked out that the more people there are, the more people will be affected by excessive heat, all else being equal. He's right. And that will affect planning. Well by mid century, USA population will likely double anyway; just from illegal immigration, so I guess that means that the Temperature (anomaly) only has to double by that time, to quadruple the exposure. We only deal in anomalies in climate catastrophys; isn’t that true ?? jinghis - people need to be careful what they wish for. This article illustrates nicely our populations response to global warming, it is moving to warmer climates. From the highly scientific phrase ‘deadly heat waves’ to the assumption that people will continue to migrate to where such ‘deadly heat waves’ are most prolific, it is garbage from top to bottom. had a look at the number of heat waves you would see GIVEN an increase in temperature. The first step is to use the right definition of a heat wave. we used one that is actually in use as a warning system today in about 40 cities around the world. Each city has its own set of important paramaters. Each had its own “death rate” based on past weather. The definition they use really is inadequate. Its not just temperature. Its temperature, humidity, duration of the extreme, and time of year. 100 degree day early in the year is more deadly than one later in the year. because none of the NARCAP models I looked at hindcasted very well. Then you can get an “idea” about what the future may hold. Not surprising if you take a warmer world as a GIVEN ( as they do), then you will find increased death. The exact number is impossible to pin down. But the exact number really isnt important. What you hope to do with this kind of study is align priorities with possibilities and direct adaptation planning accordingly. I agree with Steven on the need to revisit the definition of heat waves (see the section above). A warmer world does not necessarily translate to increased death. My solution to a warmer world is cheaper, reliable, and more abundant energy to run more air conditioning. Cheaper, reliable, more abundant energy such as that provided by nuclear reactors, natural gas, oil and coal. Instead of wasting money on solar and windmills, spend it on improving coal combustion, oil and natural gas production, and lessening the cost of nuclear reactors. Whether manufacturers will be able to come up with air conditioners that can cope with future heat waves is a matter for technological innovation. Existing ones won't cope with much higher temperatures than the low 40s (Celsisus). Extremely hot days here have already hit 47C. 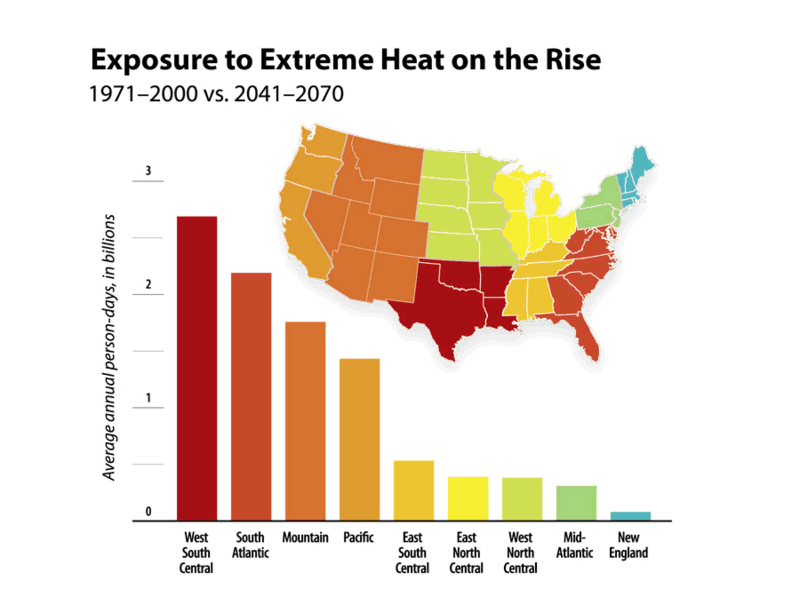 Extreme heat kills more people in the United States than any other weather-related event,…. How do they get away with flat out lying like this? Twice as many people die from cold than heat. Sure enough, the paper that Latitude pointed to did show that cold related deaths were almost double heat related deaths in the USA, during the period 2006 to 2010. The authors did make the claim about more deaths from heat, so I checked their sources. One of them was another publication on the CDC website. A brochure about heat waves. It had a graphic showing heat-related deaths far outstripped cold-related deaths by a factor of five, but the time period was different - 2000 to 2009. In the other source cited by the owners, I couldn't find any estimate of heat related deaths in the USA as a proportion of deaths from other causes. If there was global warming we wouldn't have heat waves - what? So now he's taking to a time machine to escape having to write about what's happening where he lives right now? Yes, there are now two "d" words which are banned at WUWT! Sarah Perkins from UNSW is also doing work in this area. See the web site http://scorcher.org.au/ that tracks heatwaves in Australia. "On Scorcher, we define heatwaves based on peer-reviewed and published scientific research, conducted at the ARC Centre of Excellence for Climate System Science . A heatwave is defined as at least three consecutive days where the daily maximum temperature is in the top 10 percent of warmest temperatures for that calendar date. " Also her backgrounder at The Conversation. "On the Measurement of Heat Waves"